I know I’ve been promising a video, but that has actually proven to be a little more complicated than I think I can take on right now, so I’m hoping this will help explain his anatomy and surgeries just as well. Also, disclaimer – I’m clearly not a doctor or a nurse, we’ve just learned as much as we can about Huck’s diagnosis and surgeries. If you are a doctor or a nurse and notice that I don’t have something quite right or maybe worded improperly, I apologize in advance! 🙂 The term “hypoplastic” will be used quite a bit. This just means “underdevelopment or incomplete development”. Okay, I’m done with the disclaimers. Huck was originally diagnosed with hypoplastic left heart syndrome (HLHS) when I was 22 weeks pregnant. This was diagnosed at UTMB. When we transferred care to Texas Children’s at around 33 weeks, it was later found that he actually didn’t have HLHS, but something similar. There’s a whole category of heart kids that are “single ventricle”, which includes hypoplastic left heart syndrome, hypoplastic right heart syndrome, and quite a few others. The common denominator is that all of these kids only have a single ventricle, and that most will require the same palliative three stage surgery series, but Huck’s heart is different in its own way; a rare combination of several different defects. For simplicity’s sake, you could say that his heart is fairly similar to hypoplastic left heart syndrome, but he has some other characteristics that make it different. So, I’ll take you back to anatomy class for starters. (Wishing I’d paid a lot more attention in college A&P these days!) A normal heart has two sides – a left side and a right side, made up of four chambers. The right side recieves deoxygenated blood “blue blood” from the body through two veins called the Inferior Vena Cava and the Superior Vena Cava. (Keep these two guys in mind for later.) The blue blood travels into the right atrium, down to the right ventricle through the tricuspid valve, and then is pumped into the lungs through the pulmonary artery. The blood is then oxygenated in the lungs to become red blood, and is pumped from the lungs into the left atrium, down to the left ventricle through the mitral valve, and then back out to body through the aorta and the aortic arch. First thing to address is that Huck only has a single ventricle, which means where a normal person has two lower chambers, he only has one, which is why, along with HLHS and HRHS kids, he essentially only has “half a heart”. He also has ventricular inversion, meaning his ventricles are swapped. His left ventricle is on the right and his right ventricle is on the left. But also, and this is where it gets a little complicated, add in that his “left sided” ventricle (which is actually his right ventricle) is hypoplastic. So he has what they call a “hypoplastic left-sided right ventricle”. 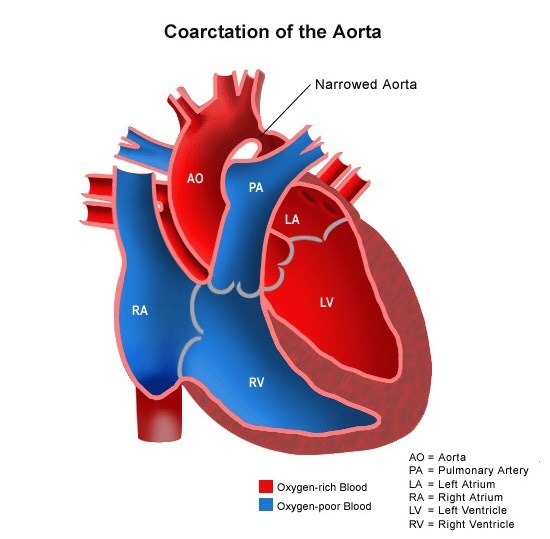 So continuing on, he also has a hypoplastic aortic arch, also known as coarctation of the aorta, which means his aortic arch was severely underdeveloped. Then he has something called “congenitally corrected transposition of the great arteries”, or CCTGA, which means his two main arteries are actually backwards and would normally be considered a defect in itself called transposition of the great arteries (TGA) but because of his ventricular inversion, his arteries are connected to the correct ventricles, making it “congenitally corrected”. He also had a very large Patent Ductus Arteriosus, or PDA. 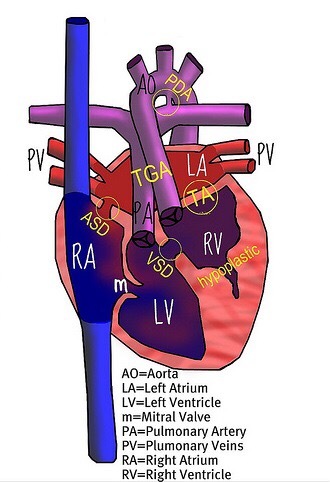 A ductus arteriosus is a blood vessel that, before birth, exists in the aortic arch that connects the aorta and the pulmonary artery. This is how a baby like Huck can survive in the womb. It provides a route of blood flow that would have otherwise been restricted by his anatomy. Within minutes or up to a few days after birth, the ductus arteriosis is supposed to close as part of the normal changes occurring in the baby’s circulation, unless a baby is given prostaglandin to keep it open. In Huck’s case, his was very large and would have most likely remained open (which is why it is referred to as a “patent” ductus arteriosis), but he was on prostaglandins just to be safe. His PDA was actually assisting his heart function by allowing systemic blood flow to the body, where as his hypoplastic arch would have restricted it. The PDA was removed during the arch reconstruction portion of his first surgery. And lastly, he had a moderately sized ventricular septal defect (VSD) and a small atrial septal defect (ASD). The two septal defects are something a lot of people have heard of, commonly referred to as a “hole in the heart”. This picture below is the closest I have found to Huck’s heart. It shows the ventricular inversion, the CCTGA, the hypoplastic left sided right ventricle, the tricuspid atresia, and both septal defects. It is only missing the hypoplastic arch, which is shown in the second picture. So how does a heart with these defects survive? 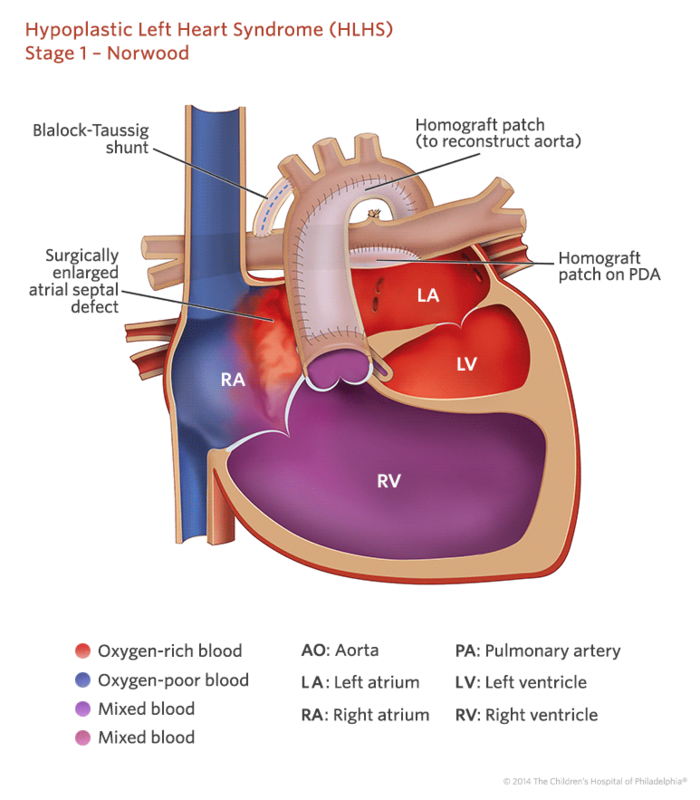 In a normal heart, the basic path of blood is oygen poor (blue) blood flows into the heart from the body, out to the lungs, where it is oxygenated (red blood) and returned to the heart, and then sent back out to the body. Red blood and blue blood are kept seperate. Since Huck is missing some of the key components to make this work and some of his anatomy is swapped, his blood flow is different. You can follow this in the picture above – blue blood flows in from the body and into the right atrium, red blood comes in from the lungs and into the left atrium. At that point, because the left sided ventricle and tricuspid valve aren’t there to do their job, it forces the blood back over to the right side of the heart, and all of the blood goes into the same area and mixes to become “purple blood”. Then the mixed blood is pumped both out to the body and out to the lungs. Purple blood is okay but not ideal long term. So for Huck’s first surgery, which was a modified Norwood, they had to make a few changes to Huck’s heart so that his blood flow to and from the lungs was adequate, and the blood flow to and from his body was adequate. The Norwood is usually done as a bridge to get a baby big enough and stable enough to support the circulation of a Glenn (second stage). The main issue for Huck was that because he doesn’t have a working valve on the left side of his heart, the blood doesn’t have a way into the left sided ventricle, and therefore it doesn’t have a way into the aorta and back out to the body. His VSD could have been used to their advantage because it allowed blood flow into the very small left sided ventricle from the back side, and would have allowed blood a way into the aorta, but his VSD was considered to be moderate and they didn’t trust it to remain open and a proper source of blood flow. To alleviate this issue, they connected his two main arteries (using a “double barrel” DKS procedure) and added what’s called a “BT shunt” to help control the blood flow to the lungs. They also removed the PDA and reconstructed his aortic arch (previously hypoplastic) so that blood flow from the heart out to the body was not restricted anymore and didn’t require prostaglandins long term. And they cut a little more out of his atrial septal defect to allow blood to flow more freely from the left atrium to the right, giving him more of a “common atrium”. This picture shows hypoplastic left heart syndrome and a homograft patch instead of a DKS, but it’ll give you an idea of how they join the two arteries into one big artery and where they place the BT shunt. The end goal for a single ventricle (a completed Fontan circulation) is to eventually bypass the heart completely for oxygen poor blood from the body, which will then go straight to the lungs. Then the heart’s only responsibility will be to receive oxygen rich blood from the lungs and send it back out to the body. For the next step in the palliation series, Huck just had his second surgery at 3 months 25 days. This surgery was a bidirectional Glenn, and they basically removed the BT shunt and connected his Superior Vena Cava (SVC) straight to the pulmonary artery. This is the first step in bypassing the heart for oxygen poor blood to the lungs. So, in a normal heart, oxygen poor blood from both the upper and lower body would normally go into the right side of the heart, and out to the lungs to be oxygenated, pretty simple. 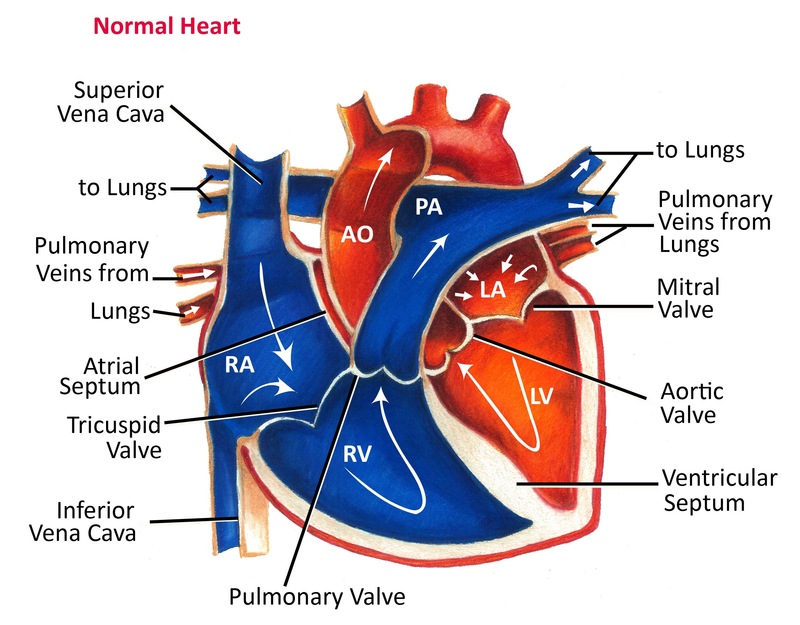 But in a Glenn, which addresses the upper body’s blood flow, the oxygen poor blood from the upper body goes into the SVC like it should, but the SVC is now connected straight to the pulmonary artery, which bypasses the heart and goes straight to the lungs. From there it will receive oxygen from the lungs, and go from the lungs into the left atrium, over into the right atrium where it will meet with the oxygen poor blood still coming from the lower body, down to his right sided left ventricle and then back out to the body. So essentially, he’ll have less “purple” blood (red and blue blood mixing). Also, not a standard part of a Glenn, but his surgeon performed a “right pulmonary arterioplasty”, which placed a patch on his right pulmonary artery because it was mildly narrowed in one spot. During the third surgery, the Fontan, which will happen at about 4 years old, they will go back in and do something similar to the Glenn, but at that time, they will connect the Inferior Vena Cava (IVC) straight to the pulmonary artery like they did with the SVC. This will complete the Fontan Circulation and bypass the heart for all oxygen poor blood from the body to go straight to the lungs. At that point, Huck will have the closest thing to “normal” blood flow (blue blood from the body to the lungs, red blood from the lungs to the heart and back out to the body) that his body can have with a single ventricle. Will he ever be “cured”? The thing to remember with all of this is that for a single ventricle baby, there is not a “cure”. They call this a palliative fix. Palliative generally means “providing relief from the symptoms and stress of a serious illness with the goal being to improve quality of life for both the patient and the family.” While they can’t reconstruct his entire heart or ever give him two ventricles, they can alleviate the problems associated with only having one ventricle and hopefully give him a long and happy life. Currently there are only people in their 30’s that have had this surgery series so there is really only data to that age, but our hope is that by the time Huck is in his 30’s, those people will be living well into their 60’s. In some cases, single ventricle babies end up needing a heart transplant and it’s even possible that some kids that have the whole 3 stage series still end up needing a transplant. That is something that will always be in the back of our minds. Huck’s single ventricle is doing all of the work, so there’s always a chance it could lose function and he could end up in heart failure. Huck does have a small advantage in that his single ventricle is a left, which is considered to be the “workhorse” of the two. He also has a small disadvantage in that his single ventricle has an area of “mildly depressed function”. We have been told it is very possibly for him to regain full function in his ventricle at some point post Glenn, just due the overall workload being reduced on the heart in comparison to a BT shunt circulation. But for factual sake and the statistical side of things, studies show that survival after the bidirectional Glenn and Fontan operations is nearly 90-95%. The mortality rate for single ventricles is usually highest between the Norwood and Glenn, what they call “interstage”. So when a baby makes it to their Glenn, it’s a big deal. Usually a pretty celebratory day around the CVICU! Will he have a normal life? From our perspective, yes, we absolutely hope so. With that being said, living any part of your life in a hospital is not normal. Having 3+ open heart surgeries is not normal. Taking medication for the rest of your life is not normal. BUT we hope that Huck will be able to do anything he wants to do. Ability is individualized. It’s very possible that he will get out of breath a little easier, and pretty unlikely to participate in heavy contact sports (in protection of his sternum), but I have heard of many kids that play sports and have exceeded expectations. I posted a while back of a girl named Meghan Roswick, who is a 25 year old Fontan with HLHS that competed in gymnastics as a child and is a competitive skier now. It will all depend on him and how well his heart holds up. We plan to do all the normal things we would have done anyway – trips to the lake, playing chase around the house, family vacations, swimming lessons, preschool, normal school, just “life”. It’s truly amazing what modern medicine can do now and we pray that it continues to progress. Texas Children’s has recently been ranked as #1 in the country for pediatric cardiology and heart surgery, so we feel confident that throughout Huck’s life, he’s in the best hands possible (we literally trust our surgeon with his life!) and they will do everything they can for our little boy. He is currently doing very well with his Glenn recovery but we are still working on crossing some things off the list before the “h word” is discussed.